Once again it's time for Mixology Monday. The theme this year is Dizzy Dairy hosted over at eGullet. In this case dairy includes anything you'd find in the dairy case, so eggs, cheese, yogurt, etc are fair game. 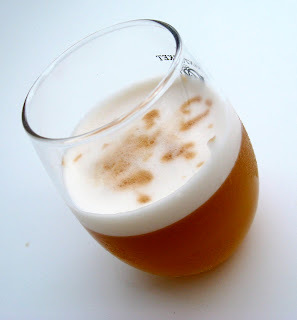 At first I was not at all sure where to go with this theme since I've never before concocted a new libation with such ingredients, but after a little research and thinking about the couple drinks I have enjoyed that utilize egg white, inspiration struck. In fact, it struck thrice. I did stay away from the cheese and stuck to eggs and milk though. Shake and double strain all but Peruvian bitters, add a dash or two of those to foam on top after straining into wine glass. 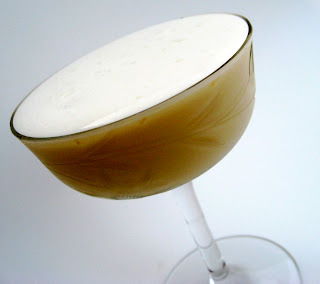 *These bitters go great on the pisco sour so I used them here just to tie the ideas together, you can get them over at Cocktail Kingdom. You can sub more angostura otherwise. Dry shake, shake with ice, double strain. Prob makes 2 servings but more satisfying to drop in entire egg. **These bitters add a solid dose of cinnamon, you can sub angostura or even dust with cinnamon in a pinch. This was the first time I've tried drink like a flip or a nog containing a whole egg, let alone made one, let alone from my own recipe. I was fully expecting an epic fail, but I do have to admit I was quite pleased with the results. Smooth, rich, and delicious. And no, I didn't have it for breakfast. Don't know where I got the idea for this next one, just came to me when I remembered I had this bottle of Castries peanut creme liquor sitting untried in the fridge which I had bought on a lark just because I'd never seen it. I give you the PnPBnJ on Rye, aka Pecan and Peanut Butter and Jelly on Rye. 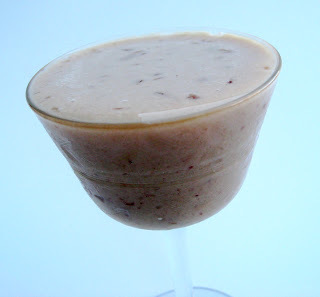 Very dessert-y, but fun, like a cross between a PBnJ and an admittedly adult milkshake. Fine, try Welch's grape if that's your thing.